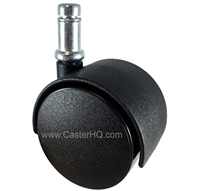 CasterHQ offers the highest quality Chair and Furniture Casters on the market. 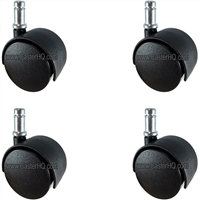 There are many types of Chairs and Furniture that use this special type of Grip Ring Stem Caster. 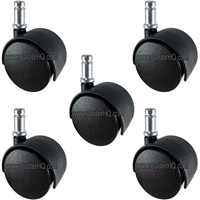 Most office chair casters have a set of 5 Casters all with 7/16" x 7/8" Grip Ring Stem also known as a Friction Ring Stem. Dinette Chairs with wheels typically come with 4 Casters with the same 7/16" Friction Ring Stem. Majority of all Office Chairs, Dinette Chairs, and Chairs on Wheels come with a universal stem caster and wheel that can easily be changed out to fit your flooring needs. 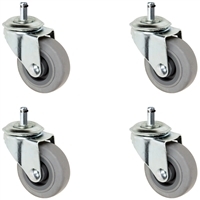 If you need more floor protection you can buy a Chair Caster with a Softer Gray Rubber wheel which is non marking and great for hardwood floors, bamboo floors, tile, and some types of short carpet. If your flooring is shaggy carpet you can choose a harder polyurethane wheel or a standard chair caster which has a dual wheel polyurethane wheel. Polyurethane Wheels are also non-marking. To sum things up, Gray Rubber will protect expensive floors and Polyurethane will roll over carpet much easier than a rubber wheel. Most chair casters that come with 2" wheels can easily be upgraded to a larger 3" wheel to increase the roll-ability and ergonomics of the chair. 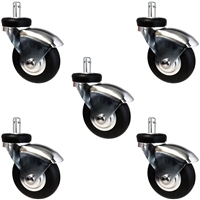 Save money and replace your Chair Casters and Wheels rather than buying a new chair. Our Prices are very competitive and our shipping speed is unbeatable. We normally ship same or next day on all orders placed for Chair Casters regardless of the quantity ordered. Please make sure to measure your chair casters stem correctly. The easiest way is to get a 7/16" Wrench and see if it fits over the chair casters stem where its snug / flush. If you don't have a 7/16" Wrench to measure you can always use a Ruler or Tape Measure and find your 7/16" spot on the tape measure and it should line up about 1/6" under the 1/2" mark. If you have questions please looks below for our phone number or email and one of our Caster and Wheel experts can help you.